The name may ring a bell. Huxtable. Where was that from again? A show…1990s…oh, that's right. The Cosby Show. Passable sitcom, but led by Bill Cosby, one of the funniest men in comedy at that time. Strangely enough, the eponymous restaurant (just opened on Gertrude St) sticks to that same formula: the basics are there, and they are OK, but the service tips it just over the edge. In terms of the menu, Huxtable is sticking to the shared plates trend that Melbourne just seems to be getting over. And, for the most part, they do well by it. A range of tapas, mezze, whatever you want to call them, are provided, and seem to be based off fresh produce of the season. So far, so good. When greeted and seated, the menu is explained. And you might want to take notes. Small plates are not just small plates: they are 'tastes', single bites of any particular entrée. Order however many of each you'd like, and they are brought out together in large batches. This can lead to confusion over who ordered what, but in terms of an innovative way of doing entrees, it succeeds. The mains, we're told, are designed for one person, but can be shared if necessary or wanted. Fair enough. The only flaw: the mains seem totally designed to share. Not only are they not big enough for one person, but they look and feel like sharing plates. Miscommunication? Possibly. The food is high quality, enough to warrant the slightly hefty price tag for such small portions, but still…something more is needed. And this is where the service enters. 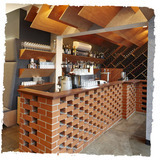 Unflappable, cheery, informal: everything a small eatery like this should be. These guys are the Bill Cosby of this place; they raise the mood from meh to Yeah. A small postscript to the food: don't miss the desserts. They're original, and pretty tasty. But they can suffer from the same problem as the rest of the place. Something just doesn't quite fit. The ice-cream sandwich, although deliciously yummy, suffers from its fudge centre. It should be soft and gooey, instead, it is hard and chewy. Not quite what you expect. One may like it, one may find it off-putting. But there is no doubt that all the food and service is carried out with precision and flair. Let's hope Huxtable sticks around for a while. While very young, it still has a way to go before gaining status in the eyes of fickle Melbournians. Maybe some time to grow into its skin will iron out the flaws. For now, a solid eatery with everything one needs is there. And sometimes, that's all one wants. Reliability. Why? 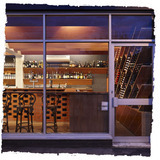 Something new and fresh on the jaded Melbourne restaurant scene. When: Tues-Fri: 12pm - late. Sat-Sun: 9am - late. Cost: Affordable, but watch that the entree's don't run away from you.